Are UV Pond Filters / Sterilizers The Best Choice For My Pond? Is A UV Pond Filter The Best Choice For My Pond? We hope this article will be your guiding light to help make decisions on the value of a UV pond filter and if using a UV sterilizer, or UV clarifier, for algae control in your pond is really the best option for your setup. Whether you are purchasing for the first time or investing in replacement bulbs for your UV filter, this will explain the technology, how it works, and the issues you can and can’t resolve with UV sterilization. To be clear: despite often being referred to as a “UV pond filter,” UV sterilizers & clarifiers for ponds will not actually filter the water – they use a UV light to kill ALL algae and microorganisms in the biological cycle. In this article, see how using a natural solution in your pond maintenance routine will reduce the harmful disease-carrying microorganisms and algae in your pond with a healthier living environment for all. How do UV pond filters work? What will happen if I stop using my pond UV? UV pond filters are a commonly used method to maintain clear water, but are they truly the healthiest and best solution for your backyard sanctuary? Learn our innovative solution for creating a natural biological filter in any type of pond. Are you concerned about the clarity of your pond water and/or maybe a neighbor gave you a hard time about murky water? No matter why you are reading this article, creating a positive and healthy environment with the right tools will not always be an easy job. Creating a healthy pond is about the long game and short-term solutions may leave you worse off than you started. To remove dead algae from your pond, you have a few options: mechanical filter vs. biological filter. There is a lot of debate about which is more effective and it will depend on your environment and pond type. Mechanical filtration involves getting extra debris out with a backwash and heavy cleaning of the filter machine. It starts with a UV light, regular cleaning, and eventually the machine filter will be easier to maintain with reduced algae. When you use a biological filter, the waste is naturally trapped in the tank and decomposed by beneficial bacteria. You can refer to them as the “good bacteria.” They will remove the organic waste materials rather than forcing you to physically scoop out all the bio-matter through a mechanical filter. This biological filter method is more similar to the filtration of natural ponds and has many health benefits for all the inhabitants (frogs, fish, plants, birds, bacteria, etc.). Like in any pond, effective water circulation will be one of the keys to your success. UV sterilizers and UV clarifiers remove bacteria and algae from the water through the use of electromagnetic radiation. One negative side effect is that this system severely damages or kills good micro-organisms to achieve the desired water clarity. Both sterilizers and clarifiers are essentially the same: each has a high-output ultraviolet light bulb that is contained and protected by a quartz crystal sleeve. The primary difference is in the intensity of the bulb — but what is UV light, anyway? UV light is electromagnetic radiation with a wavelength of 10nm-380nm, residing on the lower end of the visible light spectrum. Living organisms can be severely damaged by ultraviolet radiation. In your pond, microbes such as bacteria, diatoms, floating algae, parasitic protozoa etc. all will die from exposure to a UV pond filter. Dead algae cells clump together and are then trapped in the filter, which reduces turbidity and improves water clarity. A UV clarifier will have the lighter intensity than a sterilizer, removing only bacteria and algae. The UV sterilizers require water to flow much more slowly through them to ensure more thorough exposure, removing parasitic protozoa, like ich, and costia which need that longer exposure time to the UV light. A UV clarifier will have sufficient intensity to remove bacteria and algae, while a UV sterilizer will remove those plus parasitic protozoa. Despite often being called a “UV pond filter,” UV sterilizers and clarifiers don’t actually filter the water. UV pond filters kill algae and bacteria, which means you need an additional filter to get it out of the water. Additionally, a pond UV light filter will not help to get rid of string algae, which does not travel in the water column and is therefore not exposed to the UV light. We have a few detailed guides on managing your pond water quality, tips to prevent new pond syndrome, and have gone in-depth on how to remove string algae from your pond. What do I need for a pond UV light system? There are a few factors you should consider when installing a UV system: the flow rate of where the UV is to be installed, the usable portion of the UV lights between water ports, and the UV lamp input and output wattage. Each manufacturer will have a different recommendation based on these parameters, so make sure you read carefully – but it is best to choose a model with more wattage than you think you’ll need. We recommend a careful comparison before committing to a pond UV light system. Most pond maintenance companies or dealers are affiliated with one or two manufacturers. Be sure to look at all your options online and compare the features and costs (including installation costs) across the board before making a decision. Speaking of costs…read on to learn more about your estimated monthly expenses. How much does a UV pond filter cost? UV pond filter unit costs can range from $150 to $300 for a 1000-gallon pond and upwards of $500+ for some pond sizes. When performed by an outside contractor, installation can cost as much as the unit itself. Bulb costs generally range from $30 to $50 and often only last one year. But the real ongoing costs are in your monthly electricity bill. To determine electricity costs, look at your monthly bill and find out what you pay per kilowatt-hour. For example, if your UV lamp is 55 watts (0.055kW) and your utility charges you 16 cents per kWh, and it runs all day, every day, then you are using (55 x 24 x 365) = 482 kWh at the cost of $77 per year. Factoring the cost of system depreciation, replacement bulbs, and electricity, the total cost of a UV pond filter for a 1000-gallon pond is approximate $175 annually. Wattage runs between 5 W for a 660 gal pond max size to 57 W for a 6500 gal pond max size. The amount of wattage you choose will be based on your pond size and the manufacturer of the pond UV light filter. When looking at your options it is always best to choose a model with more wattage and capacity than what you think you will need. There are no negative effects in choosing a larger sized UV light and it will also allow you to increase the size of your pond without replacing the UV filter. Electricity – $60-$100 / year – depending on kWh charges from utility company. The low-end investment is about $200-300 with a yearly cost of about $60. A high-end investment could run you over $800 with a $150+ yearly cost. Though prices may vary, you can spend more / less depending on product quality or installation. These average costs do not account for any extra maintenance that may occur if the UV pond filter is jammed or in poor condition. The cost of running a UV filter are high, but many people see the value of clear water and swear on the effectiveness. There are many other options available beyond mechanical filtration, but they do not always get the immediate results achieved through a UV filter for your pond. In today’s market, we suggest that you replace UV bulbs 60 days before the expiration date. If the bulbs are weak than they can lead to cyanobacteria outbreaks and other bacterial health issues related to naturally occurring Aeromonas and Pseudomonas. Depending on the amount of naturally intended microbes and macro organisms, there are different levels of toxicity with these pond inhabitants. Just because a UV bulb produces light, doesn’t mean it is productive light – so err on the side of caution! What is the impact of using a UV light in my pond? A sterilized pond does not equal a balanced or healthy pond. 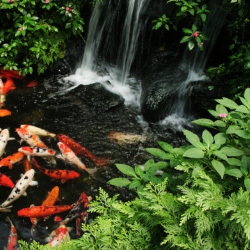 Certain kinds of bacteria will cause your fish health problems such as Aeromonas, Pseudomonas, or other gram-negative or gram-positive bacteria, but good types of bacteria are necessary to ensure the healthy life cycle of your pond. Using a UV algae killer (UV sterilizer) for long periods of time can severely disrupt the natural ecosystem of your pond and could potentially create high levels of gram-negative bacteria that get worse when the UV pond filter is shut down. Additionally, UV clarifiers can damage certain medications you might use, rendering them useless. When medicating the fish in your koi pond, it is advisable to turn off the UV pond filter. We recommend using Aqua MedZyme to offset gram-negative bacteria as a prophylactic measure to protect expensive fish. When the naturally beneficial pond bacteria in Aqua MedZyme is introduced into pond water, it will compete for the same food that these bad bacteria survive on and starve them out so they cannot hurt your fish. Just as Nualgi Ponds uses a natural solution to feed diatoms by out-competing plankton algae for nutrients and then clears away the green water; Aqua MedZyme produces a small peptide that is a natural barrier to gram-negative pathogens. This Nualgi user with a koi pond was able to completely turn of his UV lights. Achieve Similar Results With Nualgi Ponds! All algae in your pond, including floating algae removed by UV lights, feeds on the nutrients available in water, such as Nitrogen and Phosphorus. With a UV light, there are also “good” forms of bacteria and nutrients that are removed from the water column. This method of removing all good and bad microbes prevents green water, but it is sustainable for an overall balanced ecosystem. If you maintain a balanced ecosystem through good filtration, plants, water circulation, water changes, and fish / oxygen, you eliminate the need for an algae-killing UV system. With a natural biological cycle, the excess nutrients are consumed by plants and diatoms to remove bio-matter waste. As a result of the food chain, phytoplankton consumes diatoms, then healthier fish and plants benefit from the same nutrition. To create a balanced ecosystem – you want to promote the growth of diatoms that will out-compete the Nitrogen and Phosphorous. This will produce more oxygen in the pond, with a healthier environment that even stimulates better plant and fish life! The science goes even deeper to discover how a healthy environment is maintained through natural methods. From our research, we have seen the value of diatoms produce more oxygen, enhance water clarity, and improve overall pond health. By maintaining the right types of beneficial bacteria, you are able to keep a pond crystal clear without a UV light. In fact, we recommend you do not use a UV light with Nualgi Ponds to keep your pond clean and clear. Through the experiences of our users, we have learned that most the most modern and successful ponds have made the UV system obsolete. Since the UV light works against the natural biological cycle, it negatively affects the efforts of Nualgi Ponds to control algae. Safe for Fish, Plants, Amphibians, Birds & Pets! Nualgi Ponds significantly improves water quality as well as the health of fish and plants. For many eutrophic ponds, results may be visible by afternoon. By restoring missing nutrients this brings balance to the natural marine food chain from the bottom up, by promoting the growth of diatoms and zooplankton. 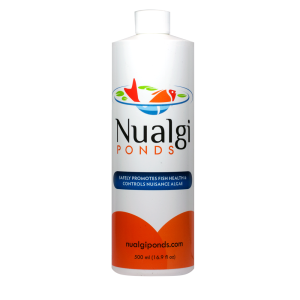 Try Nualgi in Your Pond! Should I Pull The Plug On My UV Light? The Cycle Doesn’t Happen Overnight – Green Water Does Not Always Mean Unhealthy Water. When you disconnect the UV and start using Nualgi Ponds, there might be a temporary green water period. Depending on the balance of your pond, it can take a day or more. Take a deep breath, nature has to take run it’s course. Just be consistent with Nualgi and your filtration. Afterward, as long as you use a proper filtration system and effective aeration, you will be free of UV and ultraviolet sterilizer expenditures for good. Nualgi Ponds User Story: When Bill N. switched to Nualgi Ponds, he had “consistently clear water less algae, and less maintenance” without using a UV filter! Happy Ponding! and PLEASE – we are happy to help you troubleshoot your pond algae issues. Just click the help button in the menu to contact us for pond troubleshooting assistance. I used Nualgi on Saturday and the UV light was on. I pulled the plug out today Monday. Is the Nualgi effective or should I do another dose? Go ahead and apply another dose and then once a week after that. No, you must turn the longen ionizer off when dosing Nualgi. Want to Receive Pond Care Tips? Sign-up for our Newsletter to get pond care articles & resources. Want to Receive Pond & Koi Care Tips? Sign up for our Newsletter to get first look at all of our pond care articles & resources for pond owners as well as exclusive discounts on Nualgi products. Almost Finished! Please confirm your subscription by clicking the link in the email we just sent you. *We respect your privacy and will never SPAM you or share your email address.